One of the 'New7Wonders’ of the World, the city of Petra, Jordan offers the perfect cruise excursion for ancient history lovers and hikers alike. Spanning a fantastic 264-square kilometres, Petra’s multiple UNESCO World Heritage Sites are full of stunning ancient structures built into the mountainside that are just waiting to be discovered by eager explorers. With so much to see, which sites and structures will you uncover first? Read on to find out all you need to know about visiting Petra’s archaeological playground. 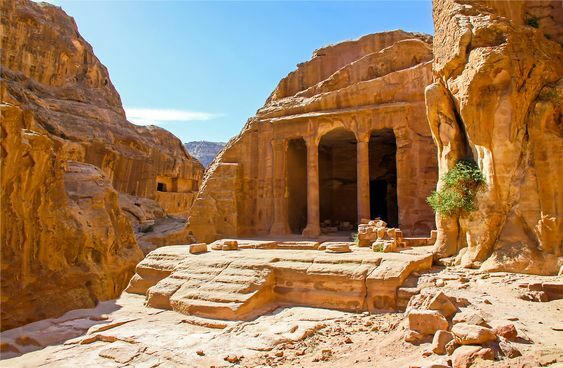 Located in southern Jordan, the rose-red city of Petra, can be found on the slope of Jebel al-Madhbah in the mountainous valley nestled between the Dead Sea and the Gulf of Aqaba. The city is thought to originate as far back as 9,000 BC, however, it is believed that it was officially established in 400 BC as the capital city of the Nabataean Kingdom, where it was a wealthy trading hub. The Nabataean Kingdom lost its independence in 106 AD when it was taken over by the Romans. Petra continued to trade but when sea trade routes began emerging and over 350 earthquakes destroyed many of its grand structures, the city began declining in wealth and importance. By the early Islamic era, what was once a thriving trade city had become a lost land, only to be rediscovered again in 1812 by Swiss explorer John Lewis Burckhardt. Today, Petra remains a stunning display of ancient architecture. UNESCO describes the city as “one of the most precious cultural properties of man’s cultural heritage”, with the site welcoming hundreds of thousands of visitors from all over the globe every year to marvel at its rose-coloured, mountain-cut structures in all their glory. With over 250-square kilometres just waiting to be explored, take a look at the above map to plan which of these amazing sites you’ll want to visit along the main tourist path of Petra. “Last year I spent a week in Jordan. I was visiting the country for a wedding but managed to squeeze in a few days of sightseeing too. 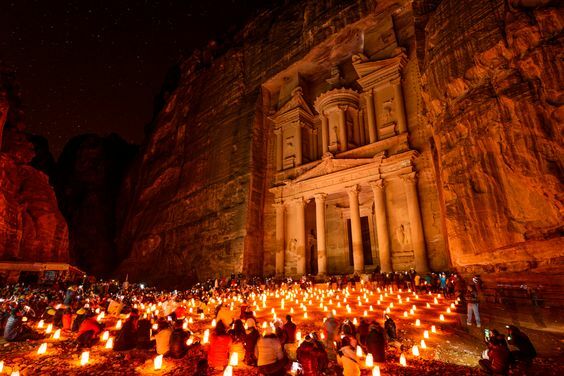 There was one place on my dream list… Petra. It’s one of those incredible places I’d seen in films and photos and couldn’t believe the ancient city’s beauty and history. I just HAD to visit. “Petra has fascinated me since I was a teenager and was #1 on my bucket list for almost 20 years, so I was completely stoked to visit this mythical-looking ancient civilization. “We are lucky to have lived in Jordan for several years (once near Petra) so we’ve had several opportunities to visit the world-renowned site of Petra. Petra is an absolute must for any first-time visitor to Jordan. Our two favourite things about Petra are the first glimpse you get of the Treasury (the iconic image of Petra) after winding your way through the Siq. “The best time to get photos of the Treasury is early in the morning or just before closing when the light is good and the crowds are sparse. “I also loved getting the famous Treasury to myself at the end of the day - the crowds had left, and I could get photos to my heart’s content! “Like most people, I imagine, the highlight of my time in Petra was hiking to the Monastery early in the morning - not only to avoid the crowds but also to relish the dawn colours flooding over Petra. As well as marvelling at the rose-coloured structures, bloggers Eric and Amber from Food And Drink Destinations recommend spending some time looking at the animals that roam the ancient city. As there is a lot of walking involved, Eric and Amber stress that it is important to do your research and plan accordingly to make the most of your trip. Make sure you are wearing comfortable clothes including closed-toe shoes and a scarf to cover your face as the area can sometimes be dusty. With hot temperatures and minimal shade, make sure you have sunglasses, a hat, sun cream and bottled water with you to keep you cool. Eric and Amber also recommend meeting other travellers and locals on your trip, as well as trying some of the local cuisine if you have the opportunity to. There a range of cafes and food shops (and toilets!) along the route, but it may be worth carrying a few snacks with you just in case. Here at Azamara Club Cruises, we offer a great 10-hour Petra shore excursion, Petra, the Rose Red Desert City, that is sure to fascinate and feed your imagination. Your adventure starts by hiking through the Siq, admiring the water channels, carvings and representations of Nabataean gods. Once through to the other side, you’ll be presented with the awe-inspiring sight of the Treasury. After a few photos and marvelling at this spellbinding structure, you’ll be shown the Greek Theatre, Royal Tombs and the Colonnaded Street, as well as given the chance to view the Temple of Qasr Al-Bint, the city’s only free-standing structure and the main place of worship of the surrounding Bedouin families that still inhabit the land to this day. It's worth mentioning that there are carriages and horse rides available, however, it is strongly recommended not to use these forms of transport due to poor treatment of the animals. Split over two days, the all-encompassing Aqaba Overland shore excursion offers a guided tour of Petra’s main sites complete with a stay at the acclaimed Moevenpick Hotel. On day one, you’ll be whisked off to the hotel where you can either explore the locality, or if you prefer, you can sit back and relax with a sumptuous buffet meal and cocktail with your fellow tour group. On day two, wake up ready for a full day’s exploring and head to “Little Petra”, an old suburb of the ancient city. Learn about the agricultural history of this small site and how it provided essential water for the crops that once grew here. After that, you’ll be off to Petra, the Red Rose City, where you can marvel at the Treasury, the Roman Theatre, Royal Tombs and more with your own eyes. After the tour, you’ll be taken back to the hotel where you can relax and enjoy a sumptuous lunch. 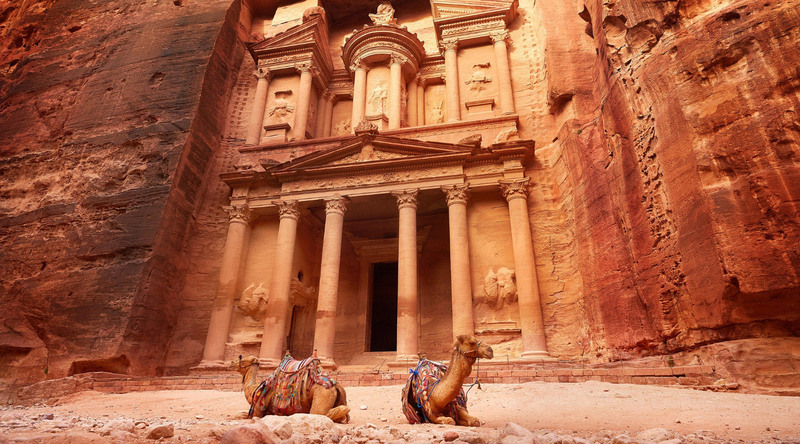 Want to explore all of our Petra shore excursions? Browse them here.